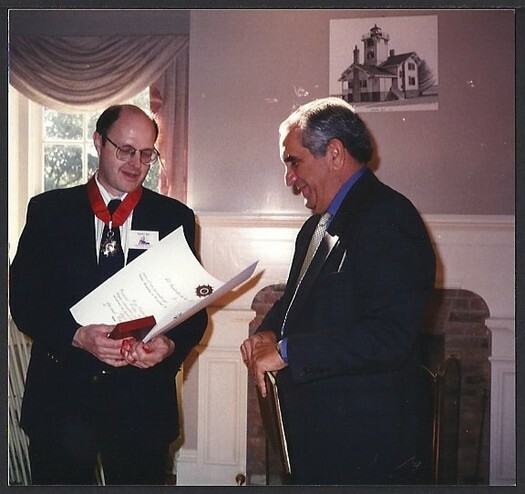 President of the Dominican Republic, Joaquin Balaguer, honored me with the Christopher Columbus Heraldic Order Award in 1996. It brings with it the title “Comendador.” This was in recognition of my dedication, work, and research into the life of Christopher Columbus. I was also honored to receive the prestigious Columbus Cross medal (photo above). It was presented to me by Pedro Morales Troncoso, the governor of the Christopher Columbus Memorial Lighthouse in Santo Domingo, Dominican Republic. Life memberships in the philatelic organizations since 1972 include the American Philatelic Society, British Caribbean Philatelic Study Group, International Society of Guatemala Collectors, the Society for Costa Rica Collectors & Cuban Philatelic Society of America. I have and had numerous memberships in other philatelic societies and organizations over the past 40 years such as the American Topical Association (ATA). Since 1987, I have been the owner of MR. COLUMBUS, a company which specializes in the worldwide philately of “Christopher Columbus” & “Discovery of America” ... plus other explorers of the New World.